Leveraging one our industry experience, we are engaged in manufacturing and supplying a large gamut of Safety Leg Guards. Our range includes Leather Leg Guard and Jeans Leg Guards, which are available in varied designs, shapes, colors and patterns. These products are widely acclaimed for their reliability, durability and high comforts. 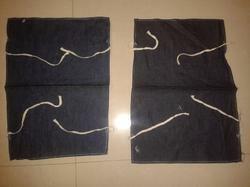 Our in-depth industrial experience enables us to manufacture and supply a wide range of Jeans Leg Guard. Our range is made by using premium quality jeans fabrics and latest mechanisms, which make them more durable and reliable. These leg guards are widely accredited for their flexibility, high strength, stretchability and optimum quality. Providing complete protection to the legs, these leg guards are offered at most economical rates in the market. 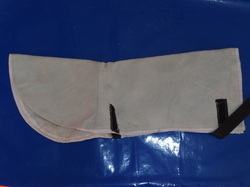 We are well-known manufacturers and suppliers of a large gamut of Leather Leg Guard. These products are made using pure leather, which is sourced from trusted and reputed vendors in the industry. We have developed our range in accordance with the international quality standards. Owing to their unmatched quality and unique attributes, these leg guards are highly demanded and accepted all over the world.